William Manchester gives a thorough yet eminently readable account of the times, political attitudes & events surrounding the assassination of President John F. Kennedy. The Death of a President. New York: Harper & Row, 1967. First edition of the historian's most well-known and enduring work. Octavo, original blue cloth. Signed by William Manchester on the title page. Fine in a near fine dust jacket with the lightest of shelfwear to the crown of the spine. A very bright example. Originally published in the spring of 1967 to positive reviews, it sold more than a million copies by the summer of that same year. It went on to "became a best seller and later was given the Dag Hammarskjold International Literary Prize" (New York Times). 2007-09-06. New. Ships with Tracking Number! INTERNATIONAL WORLDWIDE Shipping available. Buy with confidence, excellent customer service! 1996-03-05. New. Ships with Tracking Number! INTERNATIONAL WORLDWIDE Shipping available. Buy with confidence, excellent customer service! 2013-11-01. New. Ships with Tracking Number! INTERNATIONAL WORLDWIDE Shipping available. Buy with confidence, excellent customer service! 2013-08-01. New. Ships with Tracking Number! INTERNATIONAL WORLDWIDE Shipping available. Buy with confidence, excellent customer service! 2013-11-01. Good. Ships with Tracking Number! INTERNATIONAL WORLDWIDE Shipping available. May not contain Access Codes or Supplements. May be ex-library. Shipping & Handling by region. Buy with confidence, excellent customer service! Harper & Row Publishers-. Hardcover. B0063KUTC0 DELUXE-original 1963 hardback in SLIP CASE . Fine. 2013-06-01. New. Ships with Tracking Number! INTERNATIONAL WORLDWIDE Shipping available. Buy with confidence, excellent customer service! 2013-08-01. Good. Ships with Tracking Number! INTERNATIONAL WORLDWIDE Shipping available. May not contain Access Codes or Supplements. May be ex-library. Shipping & Handling by region. Buy with confidence, excellent customer service! Harper A first edition in dj. . STAMPED FROM THE LIBRARY OF GORE VIDAL. FIRST. Harper and Row. Hardcover. B0013QT0LK original 1967 Harper & Row hard cover - 1st edition 1st printing - minor staining to page edge - minor fade to edge of cover - otherwise dust jacket fine binding strong contents clean - now in mylar cover - enjoy . Very Good. New York: Harper & Row, 1967. First First Edition [stated], presumed first printing. Hardcover. Very good/Good. xvi, , 710,  pages. Chronology on front endpapers. Map on rear endpapers. Occasional Footnotes. Glossary. Charts. Diagrams. Appendices. Sources. Index. Name of previous owner on half-title. DJ has some wear, soiling, edge tears, chips, and front flap creased. Minor edge soiling. William Raymond Manchester (April 1, 1922 - June 1, 2004) was an American author, biographer, and historian. He was the author of 18 books which have been translated into over 20 languages. He was awarded the National Humanities Medal and the Abraham Lincoln Literary Award. His best-selling book, The Death of a President (1967), is a detailed account of the assassination of President John F. Kennedy. In 1964, Manchester was commissioned by the Kennedy family to write the book. Manchester, who retraced the movements of President Kennedy and Lee Harvey Oswald before the assassination, concluded, based on his study of Oswald's psychology and their similar training as Marine sharpshooters, that Oswald had acted alone. Manchester had the support of Robert and Jacqueline Kennedy, but later had a falling-out with Robert over Manchester's treatment of President Lyndon B. Johnson. Before the book could be published, Jacqueline Kennedy filed a lawsuit to prevent its publication, even though she had previously authorized it. The suit was settled in 1967, reportedly with Manchester's agreeing to drop certain passages dealing with Kennedy's family life. In his collection of essays Controversy (1977), Manchester detailed Kennedy's attempts to suppress the book. 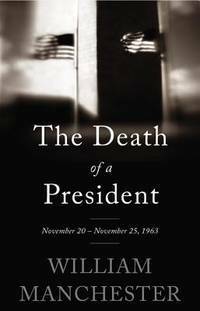 The Death of a President: November 20-November 25, 1963 is historian William Manchester's 1967 account of the assassination of John F. Kennedy. The book gained public attention before it was published when Kennedy's widow Jacqueline, who had initially asked Manchester to write the book, demanded that the author make changes in the manuscript. The book chronicles the long November weekend in 1963 from a small reception the Kennedys hosted in the White House the evening of the trip to Dallas, through the flight and trip to Texas, the motorcade, the assassination, the hospital, the plane trip back to Washington, and the funeral. The friction between the Kennedy and Lyndon B. Johnson factions, the worldwide reaction, and Lee Harvey Oswald's unplanned televised execution by Jack Ruby are all discussed in painstaking detail. In early 1964, Jacqueline Kennedy commissioned Manchester to produce an account of the assassination. She and the Kennedy family wanted a definitive telling of the events to preempt other books, including Jim Bishop's forthcoming The Day Kennedy Was Shot. Kennedy was familiar with Manchester's work through Portrait of a President: John F. Kennedy in Profile, his account of the president's first year and a half in the White House. Manchester had met and grown to admire her husband when both were recovering from war wounds in Boston. The book agreement stipulated that Jacqueline Kennedy and the president's brother, Robert F. Kennedy, then Attorney General, would approve the manuscript. As part of the agreement, Manchester was to receive an advance of $36,000 but only against the income from the first printing. All other earnings would go the John F. Kennedy Library. Kennedy promised Manchester exclusive interviews with members of the family, and sat for 10 hours of interviews with him. Manchester interviewed 1,000 people for the book, including Robert F. Kennedy; only Marina Oswald refused. Working 100 hours a week for two years to meet an accelerated 1967 publishing deadline, the stress of focusing on the assassination sent Manchester to a hospital due to nervous exhaustion for more than two months, where he completed a manuscript of 1,201 pages and 380,000 words. Manchester turned in the manuscript to his editor at Harper & Row, Evan Thomas, and to the Kennedy family for review in March 1966. He received an offer of $665,000 from Look magazine for serial rights; his agent had obtained an agreement that payments for a serial would go to the author. In early 1964, Jacqueline Kennedy commissioned Manchester to produce an account of the assassination. Harper & Row published The Death of a President in the spring of 1967 to good reviews. It sold more than one million copies by summer and was later given the Dag Hammarskjold International Literary Prize. By 1970 the book had earned $1 million in royalties for the Kennedy Library. New York: Harper. 1967. First Edition; First Printing. Hardcover. Very Good+ in a Very Good+ dust jacket. First Edition stated. Toning to pages. Scuffing to page edges as well as to front and rear panels. Corner clipped to upper front flap. Edge wear. ; 8vo 8" - 9" tall; Original unclipped dust jacket protected by archival Brodart cover. All domestic orders shipped protected in a Box. .
London: Michael Joseph, 1967. blue cloth, light rubbing, some minor marks to cover, 784pp, maps & timelines. becomming very scarse.. 1st Edition 1st Printing. Hard Back. Good/No Dj. 150x230mm. Harper & Row, Publishers. Very Good in Very Good Dust Jacket. 1967. First Edition: First Printing. Hard Cover. 011312: Bookjacket/dustjacket now protected by a new Brodart Mylar Cover. Dustjacket is complete but has two small, repaired, edge cuts. Boards and pages are clean, unmarked, bright, tightly bound and sharp cornered. Scarce, Out Of Print, Book. Front and back endpapers have a detailed Chronology of events and Map showing the Route of the State Funeral which has a light pen line on it. Otherwise, would have classified book as in Fine Condition. : 6.5 x 9.5 in. : 710 pages . New York: Harper & Row. 19671. First Edition. Hardcover. Very Good+ in a Very Good+ dust jacket. Edge wear. Soiling to front and rear cloth. First Edition stated. ; 8vo 8" - 9" tall; Original unclipped dust jacket protected by archival Brodart cover. All domestic orders shipped protected in a Box. .
Harper & Row Publishers, 1967-01-01. Hardcover. Used:Good. BBS Publishing Corporation, 1996-11-01. Hardcover. Used:Good. Writers Publishing House. Used - Good. Shows some signs of wear, and may have some markings on the inside. Harper & Row. Hardcover. B0006D7D2E FIRST EDITION/ FIRST PRINTING, 1967, Harper, In Great Condition Hardcover ~ Slightest shelf-wear ~ PRISTINE pictures and text, AU43, | Your orders are meticulously inspected, packed securely, and shipped ASAP, quick responsive customer service insures customer satisfaction, , international and expedited shipping available for most items . Fine. Mei Ya Publications, Inc., 1967. This edition was published in Taiwan for sale in Taiwan only, text is in English, jacket is not price clipped. Very rare edition.. 1st Edition. Hardcover. Very Good/Very Good. New York: Harper & Row Publishers, 1967. Book. Near Fine. Hardcover. 1st Edition. First Edition/First Printing. Hardcover in dustjacket. 710 pages. The late author's monumemtal narrative about the assassination of President John F. Kennedy. A significant contribution to history and an eminent literary achievement. A 1.5" piece chipped away from the bottom of the front dj flap, otherwise a near fine first state dustjacket over a near fine and solid book. Ships in well-padded box..
New York City: Harper & Row, 1967. 1st Edition. Hardcover. Very Good/Near Fine/Good. Beautiful First Edition,4to., 710pp. Original blue cloth with titles on spine stamped in gilt. Square, tight and clean throughout. A touch of wear to spine ends and tips but very minor. Edges a bit toned. Unclipped wrapper,($10.00), has wear to edges and closed tears in both front and rear panels but still a fresh, bright and complete example. A very attractive collectable copy at a great price. Harper & Row, Publishers; New York;. Hardcover. Very good in very good nicked dust jacket. First edition * . Very Good. 1967. Harper & Row Publishers. Hardcover. 0671049607 New Condition. . New. Back Bay Books. PAPERBACK. 0316370711 New Condition. . New. Harper & Row. Hardcover. B0006D7D2E New Condition. . New. Harper & Row Publishers. Hardcover. B01K3RQ4LI First Edition. Book is clean. Crisp pages. Tight binding. Moderate shelf wear on dust jacket. . Very Good. 1996-03-05. Good. Ships with Tracking Number! INTERNATIONAL WORLDWIDE Shipping available. May not contain Access Codes or Supplements. May be ex-library. Shipping & Handling by region. Buy with confidence, excellent customer service! London: World Books, 1968. bluie cloth cover, illus dj, light rubbing, , light rubbing, 763pp, covers in great detail the events of nov 20 - 25. . Book Club (BCA/BOMC). Hard Back. Very Good/Good. 140x205mm. BACK BAY. New. 9.19 x 6.44 cm. Harper & Row Publishers, 1967-01-01. 1st. Hardcover. Near Fine/Near Fine. No marks inside or out. Clean hardcover with square binding and sharp corners, mild fade to cloth edges. Unclipped ($10.00) dustjacket with light wear including a 1/4 inch tear to top back edge, in fresh mylar. NY: Harper & Row, 1967. Stated First Edition with no additional printings indicated, 1st printing. xv, 710 pages. - - Wrapped, boxed and promptly shipped with tracking provided. Back Bay Books. PAPERBACK. B01MSK36RT Meets the good condition guidelines. Dust jacket has some staining and crinkling. Has wear. Five star seller - Buy with confidence! . Good. Proof copy. Hardcover. Good. The title does not appear (no title or copyright page) nor does the publisher or author's name. Author's initials are at the end of the Foreword. 710 pages. Chronology, maps and list of sources, etc., in rear. Covers soiled with puckering of cloth. Endpapers are browned (see photo). Small corner of rear free endpaper is torn off, adhering to paste-down endpaper. Firmly bound, with no page markings. New York,, Ny, U.S.A.: Harper & Row, Publishers, 1967. 1st Edition 1st Printing. Hardcover. Very Good/Very Good. 8vo - over 7¾" - 9¾" tall. Stated First Edition With Jacket Code 0467. Light Fading Of The Board Edges And Tanning Of The Page Edges. Small Brown Stain On The Upper Edges. The Unclipped Jacket Has Minor Wear And A Small Store Price Sticker On The Back. Harper & Row. Very Good/Fair. 1967. Hard Cover. 8vo - over 7¾" - 9¾" tall Very good conditon hardcover with torn dustjakcet . Harper & Row Publishers. Hardcover. 0671049607 . Fine. Back Bay Books. PAPERBACK. B01MSK36RT Missing dust jacket. Meets the acceptable condition guidelines. Has wear. Five star seller - Buy with confidence! . Fair. London: World Book Company, 1968. blue cloth, 763pp. 2nd Edition. Hard Back. Very Good. 30 x 130 x 200 Mm. Harper & Row. Book Of The Month Selection. Also Stated As First Edition. Blue Cloth Boards With Gold Lettering. Binding Is Sound. Pages Are Clean. The Dust Jacket Has Scuffing, Creasing And Moderate Wear To Edges. . Very Good. Hardcover. 1st Edition. 1967. Blackstone Audiobooks. Used - Good. Shows some signs of wear, and may have some markings on the inside.